Many of us are hunkered down in the midst of Snowpocalypse ’11. In New England, we’re supposed to get MORE snow on Saturday and then MORE again on Tuesday. Uhm, yeah. Where to put it all? Well here’s an idea: eat it! Seriously, if you haven’t whipped up a batch of snow ice cream this season, there ain’t no time like the present. 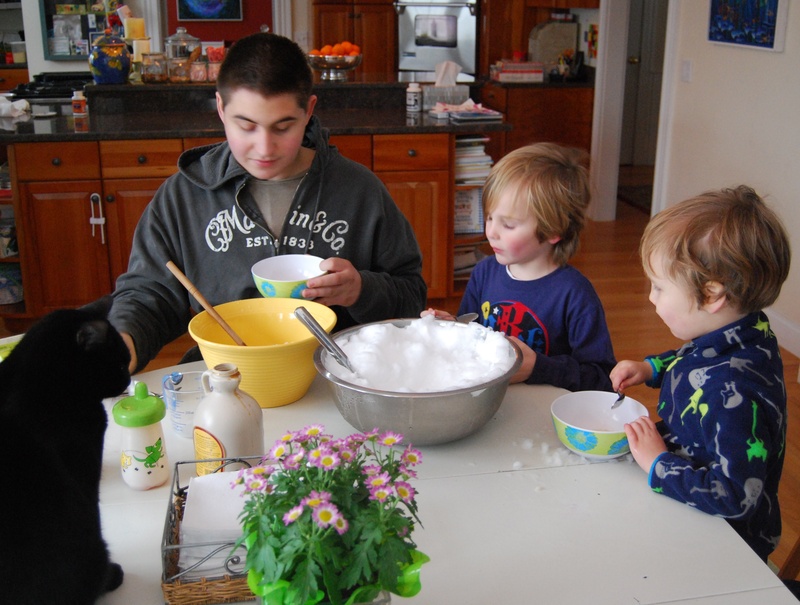 Kids love this kind of “cooking,” so you can get a little creative mileage out of it too. My oldest son prepared a batch with the little guys before going back to college last week. He started with a recipe from AllRecipes but made his own variation, which appears below. And yes, there’s a cat on the table. That’s how it rolls at our house. Gather up a bowl full of totally pristine freshly fallen snow. Eyeball a gallon’s worth. Bring it inside and stir in sugar, maple syrup, and vanilla to taste. You may prefer less or more of each ingredient, so start on the scant side and taste as you go. Then stir in just enough milk for a creamy consistency. Serve right away, assuming you can get your family to stop eating it straight out of the mixing bowl. I’ll be heading out to rustle up tonight’s dessert momentarily. Fascinating!….says the girl who’s lived her entire in Florida. Really? Snow ice cream? awesome…that’s putting a positive spin on miserable weather. Now we’ll just have to eat it all before it does.